TGIF!!! Also for those of you who are Irish (and to those who find a way to be Irish) Happy St. Patty’s Day! I hope everyone has had as productive a week as it seems I have. Now that the weekend approaches it’ll be time to recover from all the great events and shopping that’s been done. For this entry today I ‘ve taken a break from my coverage of Skin Fair to bring some new items from TMD from brands such as Modulus and ::K:: and also a new (and old) release from FLite. 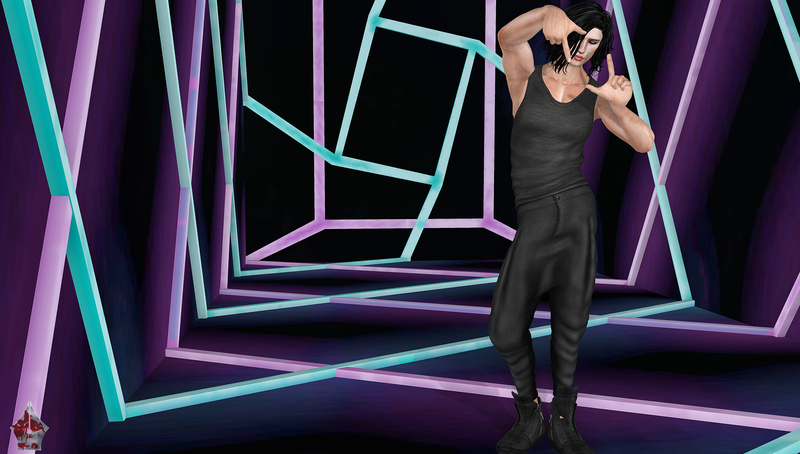 Evan is the latest in the M-Bare line of skins from Modulus that was released for the current round of The Men’s Department. It has the options for brows or browless and also has built in facial hair if you choose to use it and there is also an option for a combination of both. I like how this skin paired up with the Miles shape from REACH. I’ve got a double helping of ::K:: in the form of the “Leon Sarrouel” pants and the “Leon Singlet” which make a great matching pair and are currently also available at TMD. Inside the package there are sizes for [SIGNATURE] Gianni, SLink Physique, Standard and TMP body types. Now I usually don’t have too many issues with clothing but I noticed that for the Leon Singlet which I am wearing for the Gianni body, when you alpha out the back to not make your skin poke out there is a space under your shoulder that looks like a bite has been taken out. Now without the alpha cuts there are spots that poke out from the back. I’m not making a huge gripe about it but I thought it was necessary to inform the readers of this and will be getting a hold of Mr. Ragu about it as well. It may not be an issue if you are standing still without an AO but everyone uses them these days so that might create and issue. FLite has gone and done it again! They have refashioned one of their old releases so that it is compatible with female and male mesh body types. The “Retro” Gliders is a limited to 1000 product that is available now at their main location. It only is available as a Fatpack and gives you several out of the box options as well as the ability to color different parts yourself. Sizes include: Belleza, Maitreya, SLink and TMP for the ladies and for the fellas: SLink, TMP, and Standard sizes which could also be applicable for Unisex styling. These are definitely some cool kicks and I have always enjoyed the FLite brand. For my hair, I have the “No Offence” which is what inspired me mostly for the theme of the post. I’m a pretty casual fan of the band, The Cure and the hair screamed the essence of frontman Robert Smith so I ran with it and tried my best to create a look that was reminiscent and used the MINIMAL Illusion #3 backdrop because it seemed very 80’s/90’s and was perfect for what I needed. Be sure to check back for more coverage of Skin Fair and also the newly stocked Men Only Monthly event which I’ll be sure to have goodies from. Have yourselves a great weekend and until next time, stay stylish fellas.